The Sounders’ dip into soccer’s loan game has been hardest on Thor. The French bulldog was left home in Bournemouth, England, a coastal resort city 107 miles southwest of London, when defender Brad Smith signed last August to play for the Sounders. Smith’s matter-of-fact nature about leaving the 2-year-old pup with friends — and his home empty — comes from an odd security in uncertainty. His Sounders contract is a short-term loan, where AFC Bournemouth still maintains Smith’s rights, but the Sounders are paying about half of Smith’s $1.14 million salary ($564,364.67) to have him play in Seattle. The deal is yet another in Major League Soccer’s continued attempt to be regarded among the world’s best. League commissioner Don Garber first announced in 2013 his goal to reach elite status by 2022 and continues to trumpet the dream like a morning affirmation. In 2016, a former New York Red Bulls coach, Jesse Marsch, who is currently an assistant for RB Leipzig in Germany, told Sports Illustrated it’s “not impossible, (it’s) improbable.” That’s a fair assessment, especially considering the U.S. men’s national team failed to qualify for the 2018 World Cup. MLS being on par with some of the world’s best, such as the Premier League (England), Bundesliga (Germany), Serie A (Italy), La Liga (Spain) and Ligue 1 (France), in three more years seems a tad lofty. But then there’s Smith, a 24-year-old left back who began training professionally at age 14 with Liverpool of the English Premier League. That league is ranked among the best in the world, with a market value of $9.71 billion, according to transfermarkt.us. Within the past 13 months, MLS signed Premier League stars Zlatan Ibrahimovic (Los Angeles Galaxy) and Wayne Rooney (D.C. United). They tore up the league, with Ibrahimovic finishing as the third player in MLS history to score 20 or more goals and register 10 assists in a season while Rooney, a five-time Premier League champion, helped a flatlining club spark a playoff run. But those players are in their 30s. And Seattle’s last English Premier League player, Tyrone Mears, was 31 when he signed. Smith coming here as a rising player with talent good enough for the best and seeing value in MLS says a lot. It also strikes immediate concern because his loan expires June 30. 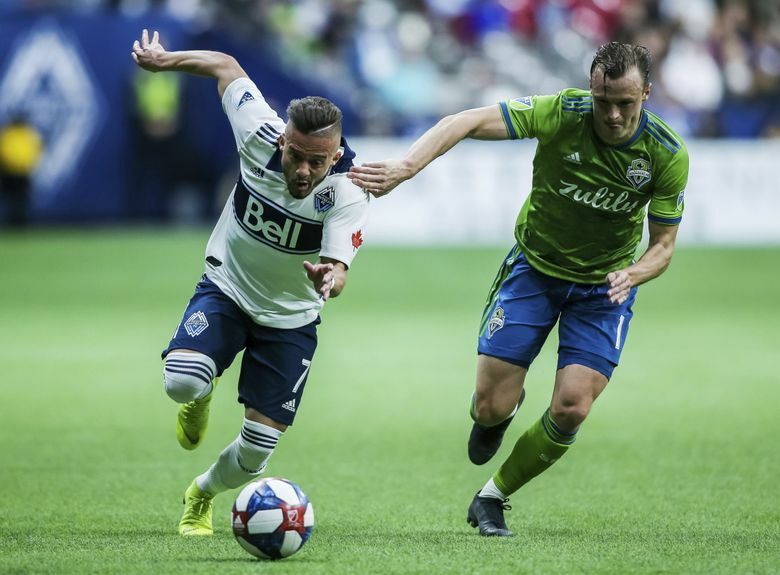 It’s natural to immediately count up the games and wonder about strategy with that deadline — and Sounders coach Brian Schmetzer is quick to point out the team’s depth with Nouhou, a talented 21-year-old who made his professional debut in 2015 in Cameroon. Part of the reason Smith felt comfortable coming to MLS is the league’s four-year contract to broadcast matches on Britain’s Sky Sports in 2015. He’d watch on TV and was impressed with the Sounders’ crowds. The Sounders averaged about 40,000 fans per game in 2018, which can compete with the English Premier League’s mid- to lower-tier teams. Bournemouth has the EPL’s smallest stadium at about 11,500 seats, compared with CenturyLink Field’s typical reduced capacity of about 41,000 for soccer. When asked about the mental aspect of having a looming date of when you could be recalled by Bournemouth, Smith turned the topic to one I’m trying to avoid in taking over the Sounders beat — basketball. Suddenly, loans appear more civilized. And MLS needs them, along with transfers, to reach an elite status on the global scale. With Smith, the Sounders bought into the global market, but their aim is to have a player like expected first-team signee Danny Leyva, a 15-year-old midfielder groomed in their academy system, be of value to loan out internationally, where the Sounders would be paid. There’s no immediate plan to loan out Leyva, but it’s an option for Sounders general manager Garth Lagerwey. Last winter’s start to MLS transfer window was the hottest ever for the league as a record amount of its players were sent out to leagues across the globe, the biggest signing being New York midfielder Tyler Adams’ reported $3 million sale to RB Leipzig. And Thor will just have to wait.